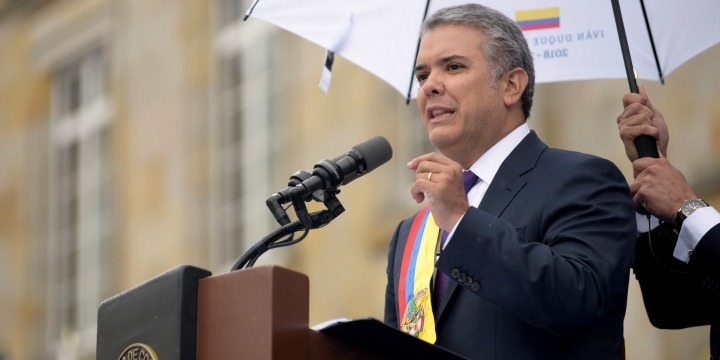 Colombia’s new President Ivan Duque speaks in Bogota, Aug. 7, 2018. Photo: Fabian Ortiz / Courtesy of Colombian Presidency / Handout via Reuters. “We hope you use the power of your office to reverse this regrettable decision that stands counter to the strong ties shared by Colombia and Israel,” ADL CEO Jonathan Greenblatt wrote in an open letter to President Iván Duque, the victor in the Latin American nation’s Aug. 7 election. “We trust that with your leadership in the region you can lend a powerful voice to those who bypass the steps to create peace between Israel and the Palestinian people,” Greenblatt said. ADL’s appeal to Duque on Tuesday came on the heels of strong criticism of Santos’ decision by other Jewish organizations.